People are typically shower lovers or bath lovers. I am hands down a bath lover. Admittedly, I can improve in many self-care areas, but I am proud to say that I am consistent with pampering myself with a bath a few times a week. Nothing helps me unwind and de-stress like a hot bubble bath. I use my bath time to light my favorite candle, listen to my slow jams playlist and to try out new bath products to pamper myself. Baths open up your pores which gives your skin the opportunity to deeply moisturize and absorb the ingredients in your bathwater, which is why its super important to be mindful of what products you use. The right bath product can really take your bath to the next level. In this post, I share five amazing products that smell good, feel good and that will take your bath from average to amazing. I purchased all of these products from Stage. Stage carries so many bath and body brands that I love. I purchased some of my go-to's and also found some new products that I recently fell in love with. 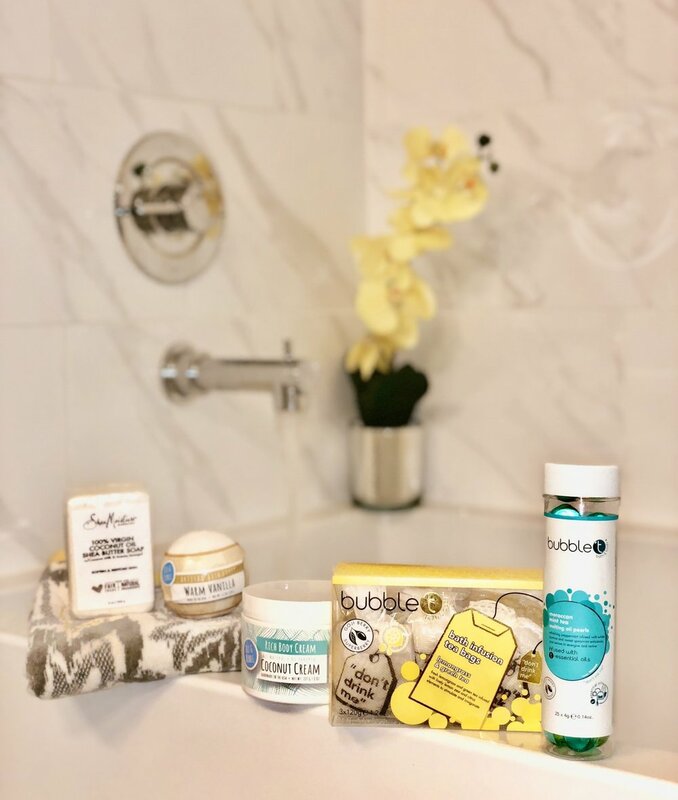 Check out my list below for 5 products for the perfect bath. Bubble T Lemongrass & Green Tea Bath Infusion Tea Bags, $8.99. Have you ever tried tea bags in your bath? This bath product seemed odd to me at first, but I was so curious, I had to try it! When I tried it, I fell in love. If you love bath bombs, you'll love infused tea bags. Please don't try to actually drink the tea. There are safety warnings all over the bags that warn you to not actually consume it. It's pretty tempting because it smells so good, but I'm sure something bad will happen if you do. These bath infusion tea bags are made up of a combination of tea, fruit notes, Goji berry extracts, and sweet orange oil. As you run your bath water, drop the tea bag under the running water and allow the tea to diffuse and soften the water. Remove the tea bag before you get in the water, and when you soak, you'll enjoy a fragrant, relaxing, tea infused bath. Thank me later! 2. 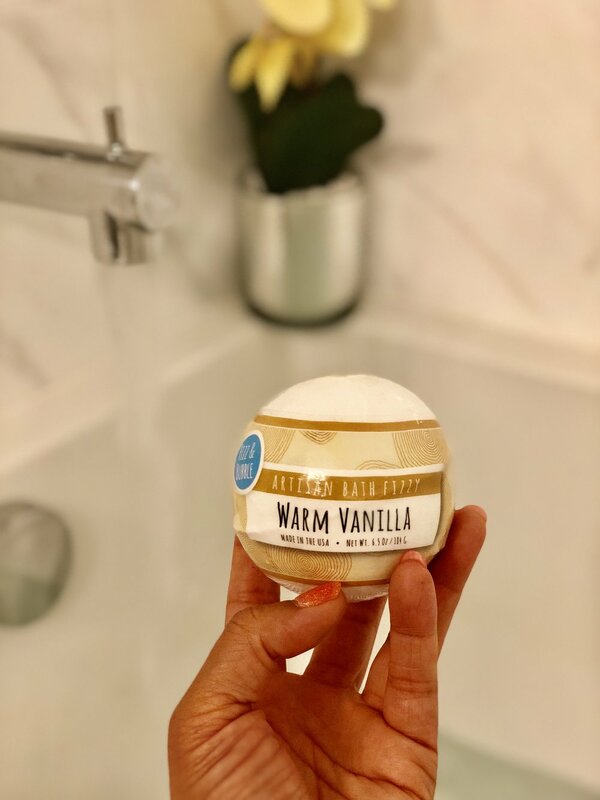 Fizz & Bubbles Warm Vanilla Bath Fizzy, $5.99. This bath product literally fizzes your cares away. When it hits your bath water, it sizzles and leaves your water smelling like vanilla while softening your skin with its an ultra-moisturizing 8-Oil blend that includes a fusion of Aloe Vera, Coconut, Grapeseed, Sweet Almond, Olive, Avocado, Sunflower, and Jojoba oils. After bathing with this product, my skin felt so soft, I did not even need moisturizer after the bath. 3. 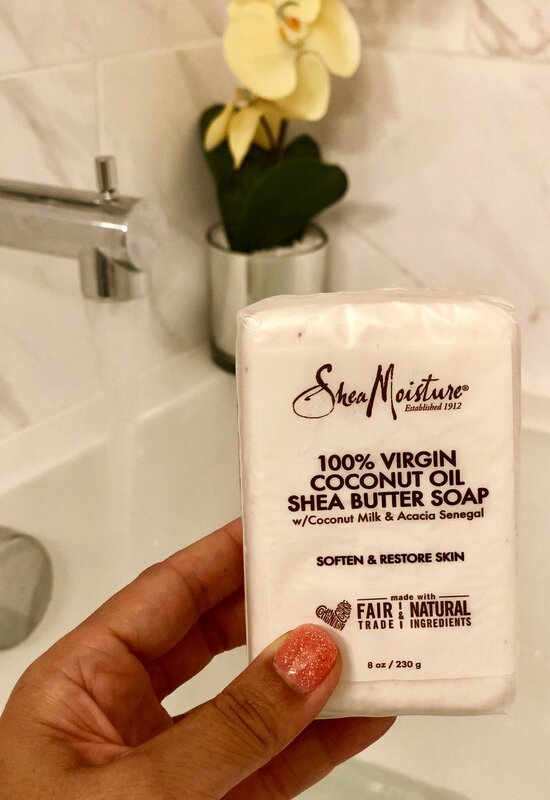 Shea Moisture Virgin Coconut Oil Shea Butter Soap Bar, $5.99. This bath product has been one of my staples for some time now. This is one that I've purchased over and over because it's just so good. The bar is made up of coconut oil, coconut milk and shea butter that helps soften and restore your skin. After using this product, your skin will feel and smell great. 4. Fizz & Bubble Coconut Cream Shea Sugar Scrub, $14.99. Warning...when you smell this product, you will want to eat it! It smells so so good. This sugar scrub is enhanced with shea butter and it scrubs away dead skin leaving you with radiant and soft skin. 5. Bubble T Moroccan Mint Tea Melting Oil Pearls, $10.99. Drop 2-3 of these bath pearls into your bath to help stimulate & hydrate your skin. You'll enjoy the soothing scent and relaxing experience. Disclaimer: This post was sponsored by Specialty Retailers, Inc but all opinions are my own.